Sometimes we aim high. 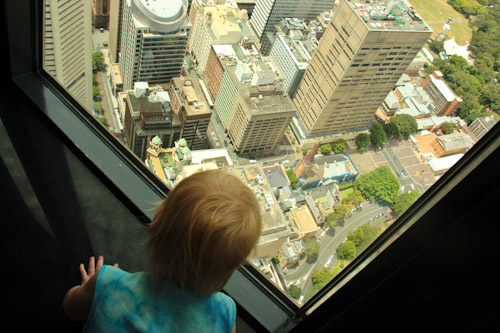 Our trip into Sydney city today had two goals — to visit my dad at his office and to reach the top of the Sydney Tower. Dad catches the bus into work every morning, and we followed in his footsteps, albeit a couple hours’ later then he did. Walking up Elizabeth Street, I kept assessing the buildings, trying to guess which one was staid enough to house federal department offices. Finally giving up on locating his office without assistance, we called Dad and he escorted us to his eighth-floor desk. 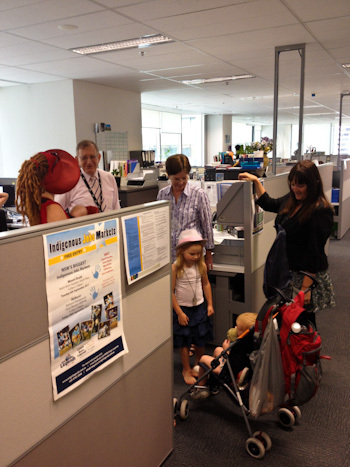 Although it’s not a usual occurrence for a family with five small children to visit the offices of the Department of Education, Employment and Workplace Relations, we were greeted kindly by dad’s colleagues as we looked around. 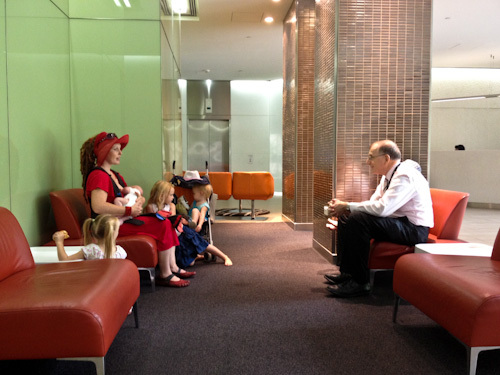 It's lovely to see where Dad spends most of his days and to meet his colleagues. 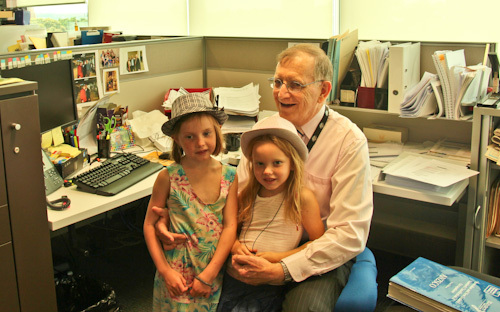 The girls like seeing photos of themselves and their cousins at Pa's workstation. Elijah is awake and alert for a cuddle from his Pa.
Our visit upstairs was understandably brief as we usually add to the noise level, and Calista just wanted to play. So we took our party back downstairs. 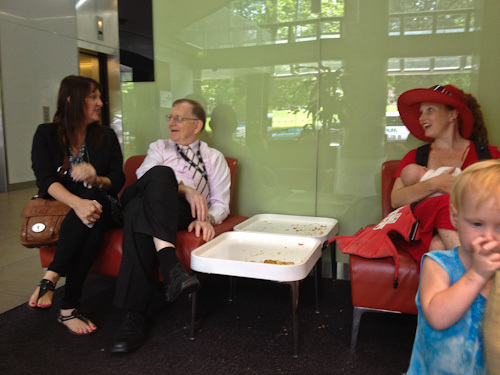 Back downstairs in the foyer, the girls eat a late breakfast of very crumbly pastries, and Dad chat while I feed Elijah. 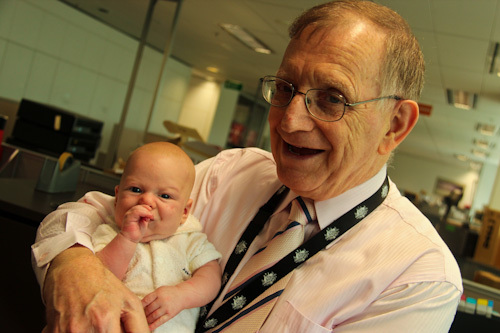 Dad's colleague Karen stopps by on her way out for lunch, and we enjoy some laughs together. 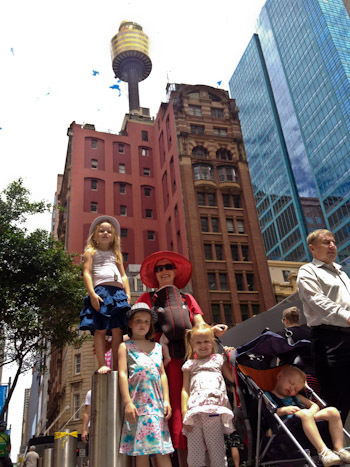 When it was time to go, Dad took us out the back way and directed us towards Sydney Tower. Although I’m usually an excellent navigator, I still haven’t gotten my bearings in Sydney and am not able to lead us around town as I have in other past cities we’ve visited. So I was thankful to be told which direction our destination lay. We only managed to get his photo of us with Sydney Tower in the background because we overshot its location and walked about a block beyond the entrance to the tower. 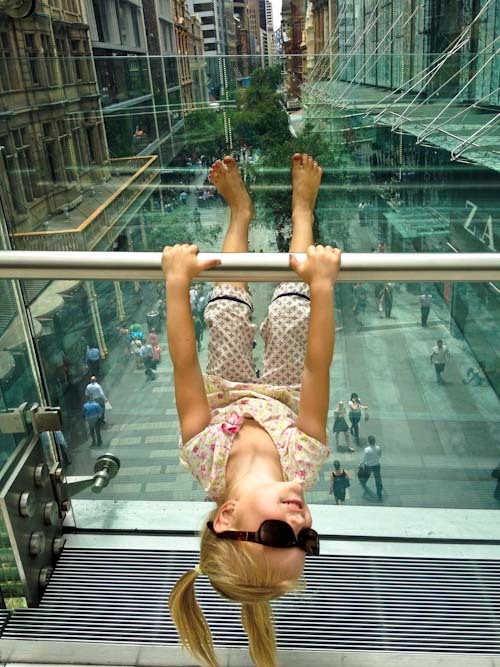 Calista treats every location as her own personal jungle gym — even when it's the walkway over Pitt Street Mall! Finally, we found the tower and took the lift to the 250-metre-high observation deck. 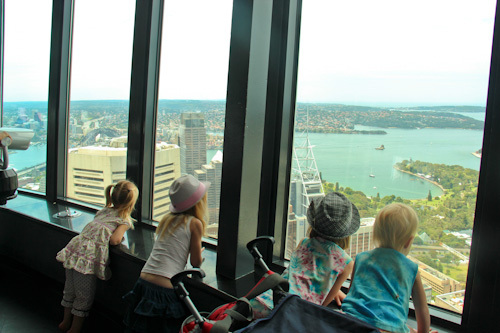 Because it’s school holidays, we’re finding the Sydney attractions a bit crowded. 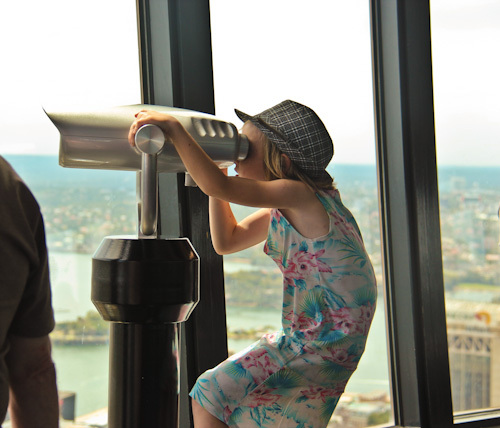 Nevertheless, we could navigate the crush of people to look through the binoculars and identify Sydney’s landmarks for the girls. 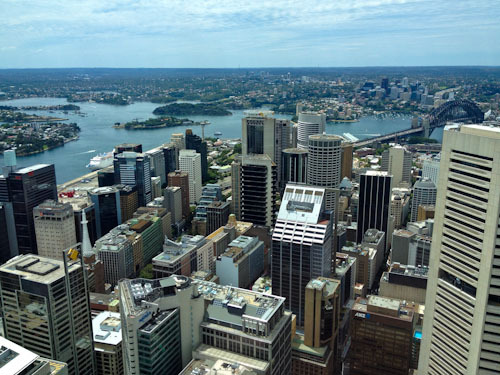 The tower's height gives us a great view across Sydney. The girls peer out the windows at the cityscape laid out before them. Delaney is the only one of our girls who was unsure about the height of the view. Aisha loves to scan the landmarks through the binoculars. Travelling through the city, the girls wanted a ride on the monorail. The big local news for the week was that the city council is discussing moves to dismantle the monorail, so we decided to try it out while we still had the opportunity. Also helpful is the fact that most of our children ride free on public transport. 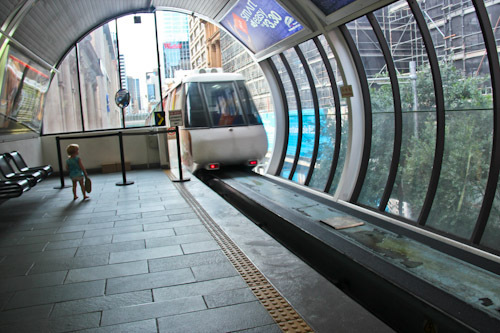 We love watching the monorail go past as much as we do riding it. Is this going to be our last time at riding this iconic Sydney transport? Our city trip ended with the train ride back home. The girls are getting confident at the train stations and have learned to recognise the muffled call of the stations as they’re broadcast across the platforms and throughout the carriages. One of the reasons that we periodically like to visit the city is to show our girls what life is like in a city environment. High-density housing, public transport, restaurants, tourist attractions and public art are important experiences for our children, and while we’re in the midst of it all, we enjoy it too! What an amazing city! Thank you for sharing.